"We feel really good about where we're at." - USC head coach Steve Sarkisian after the Trojans' eighth practice of the spring. LOS ANGELES — USC practice wrapped up, head coach Steve Sarkisian estimates, 8-9 minutes faster than it was supposed to on Thursday evening. Sarkisian says that was a tribute to the players executing at a high tempo. It was a contrast from what was considered a "sloppy" practice Tuesday. "One thing that impresses me about this group is when you challenge them with something, they respond," Sarkisian said. "The tempo was cranked up from the beginning. "Today we were going as fast as we could go to set that emphasis and they just respond every time." Thursday marked practice No. 8 of spring for the Trojans. The next time they hit the field, it will officially be the second half of spring drills. 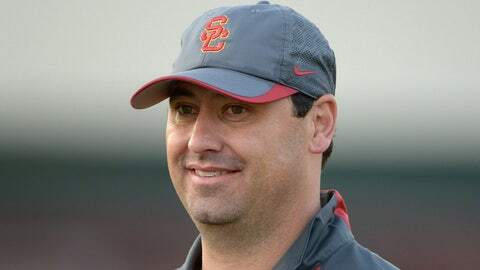 So far, Sarkisian likes what he sees. On Thursday, the USC head coach along with other members of his staff watched last season’s UW practices at a comparable spot in spring last year, as well as USC practices from last spring. His current team is right on par with where he feels they need to be. "We feel really good about where we’re at," Sarkisian said. "We feel like we got a lot of scheme implemented. We feel like our guys are developing as players. Some of the mistakes we were making early, we’re not making those same mistakes now. "For me that’s a good sign." Another good sign was the play of wide receiver Darreus Rogers. The sophomore made a couple of acrobatic touchdown catches in the redzone that required him to win one-on-one matchups. His success on Thursday, Sarkisian says "will go a long way" towards the success of the football team in 2014. "(It will go a long way) for his own belief in himself," Sarkisian said, "for the quarterback’s belief in him, for my belief in him calling those plays — all of these things add up. We’re just in the foundation stages of this thing." Thursday proved to be a big day for Rogers overall. 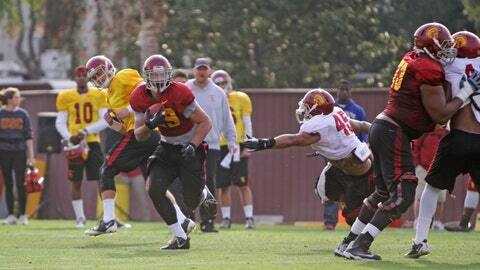 To mix things up, Sarkisian decided the team would have a dance contest during one of their practice periods. Rogers won that, too. "(Some) guys have some moves and some guys don’t," Sarkisian said of the dance contest. "I think some guys listen to country music."